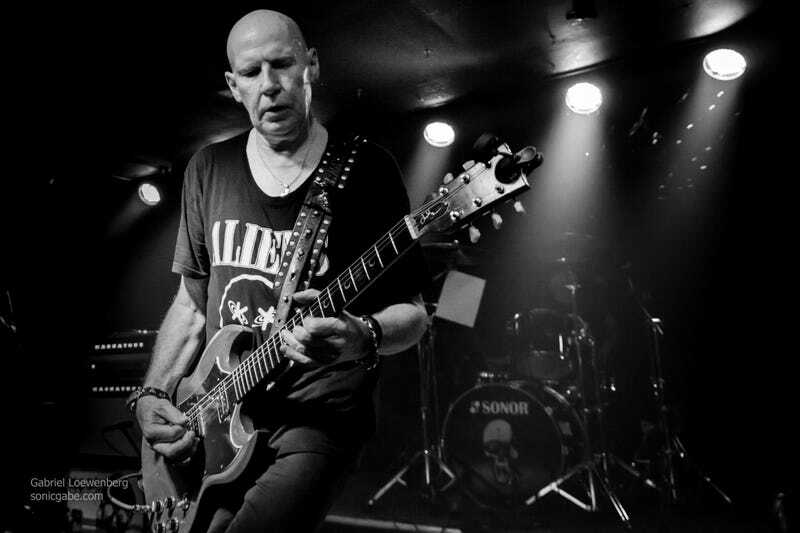 The one and only Cheetah Chrome! The legendary New York punk band Dead Boys have reconstituted to celebrate the 40th anniversary of their 1977 debut album “Young, Loud and Snotty.” Guitarist Cheetah Chrome and drummer Johnny Blitz are the only original members involved. Singer Stiv Bators died in 1990 after being hit by a cab in Paris. Guitarist Jimmy Zero is said to have some health issues and wasn’t able to partake in this venture. Bassist Jeff Magnum, depending on who you ask, declined or wasn’t really asked to rejoin. No matter. Jason Kottwitz (guitar) and Ricky Rat (bass) are more than capable and are not just hired guns. Both are long-time musical associates of Mr. Chrome. Taking the place of the late Stiv Bators on vocals is Jake Hout. He is not Stiv Bators. He is the singer of the Dead Boys. He embodies the spirit of Stiv and has his own take on the attitude and performance. He’s the real deal. Jake Hout is making rock and roll dangerous again. The whole band is the real deal. They even re-recorded “Young, Loud and Snotty” with the current line-up. It’s really good. Cheetah and Blitz are playing as good and ferocious as ever. The band as a whole is tighter and more aggressive than the original. This particular show had been postponed twice going back to last September. The first was scheduled to happen two days after hurricane Irma tore through Florida. The canceled shows were then rescheduled for December. Those were then called off days before as Cheetah Chrome was stricken with kidney stones. You get a gold star and win 7.4 Internets if you can make a kidney stones/Dead Boys joke. There is only one correct answer. Have at it in the comments. After almost a year the Florida shows finally happened. It was totally worth the wait. And I finally got to meet Cheetah in person! We’ve been internet buddies going back to the days of MySpace. A point of note about the pictures: The lighting on the side of the stage with Rat and Kottwitz was particularly bad so I wasn’t able to get any good pictures of them from where I was at. Even if I moved, the lighting would still have been horrible. As far as Johnny Blitz goes, there was virtually no stage light illuminating him or his drums. It was impossible to get anything close to a usable picture. Next time I’ll bring some clamp lights along just in case. If you are so inclined, there are many more pictures from the show on my website. Also, this show took place a Tampa’s infamous long-time live music dive bar, The Brass Mug. Way back in 1994, my band and I got banned from the original location. I forget the details exactly, but a show we set up was getting screwed up by the bar. We had maybe 40 or people there to see us. We had everyone line up, ask for their money back, and leave. The bar was not happy with that. I think some minor vandalism took place, too. I’m sure the statue of limitations is up on any crimes committed. We did eventually play there again, so all was forgiven. My point is that the now third home of The Brass Mug smells just as bad as the first. This was my first time going to this location. The same woman is working the bar, except she owns it now. The sound system is still crap. The regulars are still wonderfully weird people. It felt like home.